PSE&G anticipates that the bridge on Newark Ave., just east of Harsimus Cemetery and west of Division Street, will be closed for approximately 45 minutes this evening, possibly from 8:45 – 9:30 PM, to support the construction of the PSEG North East Grid electric transmission reliability project, www.pseg.com/negrid. Beginning on or about April 27, work will take place Monday through Friday between the hours of 7 a.m. to 7 p.m., conditions permitting. Before construction can start, the utility has been making test holes to verify the location of the existing gas main. After this work is complete, PSE&G will then begin installing new gas mains and upgrading associated service lines that carry the gas to homes and businesses. PSE&G has met several times with Jersey City officials to review the work and obtain all necessary permits. In addition, the company will host a meeting for residents in the affected areas 6 p.m. on Thursday, April 30, 2015 to explain the project in more detail. The meeting will be held at City Hall, 280 Grove Street, Jersey City. This upgrade is part of PSE&G’s Energy Strong program to strengthen and protect the state’s electric and gas infrastructure from severe weather. Customers will be notified when work is about to begin in their area and can find a list of streets at www.pseg.com/energystrong. The gas main replacement portion of the work is expected to be complete in December. The paving and restoration of the streets is expected to be finished by the spring of 2016. As part of Energy Strong, PSE&G is replacing 250 miles of older cast iron main with new plastic pipe in or near flood areas throughout its service territory. In 2014, the utility installed over 98 miles of new pipe in 34 towns throughout New Jersey. These new pipes will prevent water from entering the mains, increasing the reliability of gas service in these locations. To upgrade the mains, it will be necessary to dig trenches in the roadway to install the new pipe. As a result, there may be road closures, detours and/or parking restrictions. Local police will be on the scene to direct vehicle and pedestrian traffic. At the end of each workday, the trenches will be filled in. Plates will be secured on any other open areas so people can safely drive and walk. Once the gas mains are upgraded, PSE&G will need to access customers’ homes to connect their service and meter to the new main. PSE&G will contact homeowners to arrange a date and time to do the work. During this reconnection, customers will be without gas service for approximately four hours. We regret any inconvenience this may cause. For everyone’s safety, PSE&G crews will be using work area protection including traffic cones, utility work signs, and barriers to allow the job to be done safely. The utility reminds motorists to slow down and follow detour signs when driving through the construction area. Notice something different on West Hamilton Place today? It's a Land's End photo shoot. They're recreating winter for an upcoming catalog. 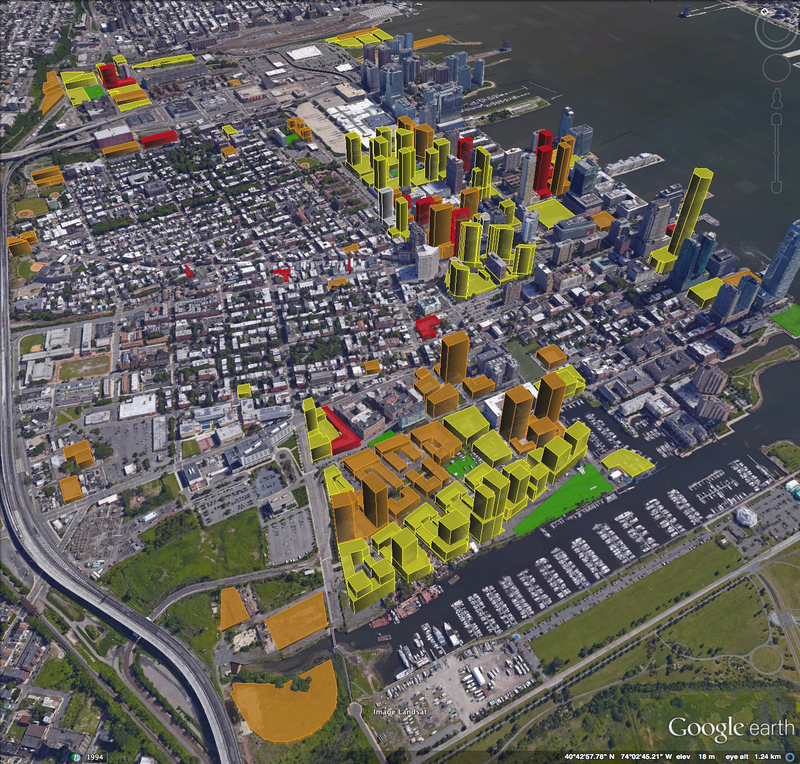 With so many developer requests being approved it's great to be able to visualize what the city has in store for Jersey City. Kathryn Moore from the Powerhouse Arts District has started to fill-in the heights of the proposed, approved and under construction properties based on Redevelopment Plans and other presentations. Color coding is the same as City Planning's Development Map. Recently the planning board approved changes to the MGM Redevelopment Plan near the Grove Street Path Station. These changes will most likely go before City Council on April 22nd. City Council Agendas can be viewed here. The MGM Redevelopment Plan can be viewed here. The weather is looking to be cold and rainy so we're canceling tomorrow night's event of The Winter's Tale. We'll let you know if it gets rescheduled. Long-time Hamilton Park resident Elna Mukaida was recognized as one of Jersey City's 2015 Women of Action this past week. Please consider making a contribution via their website at www.jerseycitycemetery.org. Please just add a note "GOATS". As many of you know, last Spring, our Volunteer family who are operating and restoring the formerly abandoned "The Historic Jersey City & Harsimus Cemetery" (www.jerseycitycemetery.org) adopted a little herd of GOATS! and also learn about their important eco-friendly project at the historic cemetery. They weren't just there simply as an 'attraction', but were contracted as little union workers to help our Volunteer team eradicate several hilly acres of invasive weeds, that were killing off our important Colonial plants & bushes. The friendly herd of Goats were with us from April thru October, and then they went back to their farm in Rhinebeck, NY for this very cold winter. We were so excited about their return to the Historic Jersey City & Harsimus Cemetery this spring, & planned for their arrival for Sunday, April 26th, when we host our annual "Celebrate Mother Earth" Festival & fundraiser at and for the historic cemetery. Sadly, our little Goats all perished last week in a tragic Barn fire at the Rhinebeck farm. The Goat Herders, Larry & Ann Cihanek of "Green-Goats" (Green-Goats.com) and their family are devastated, as all of their 100 Goats perished in the fire, plus the entire Barn was lost (and not insured). We volunteers are devastated too, as we loved these animals, who each had a very special and gentle personality. We were so saddened to learn of the tragedy, but to our surprise, the Herders have spoken with us, and are acquiring new Goats, and are still planning to bring the new Goats to our historic cemetery, as planned, on Sunday, April 26th. Although our not for profit mission has no regular revenue or major funding, we hope to seek SPONSORSHIPS for the 2015 Goat Project to raise $10,000 (or more), and to present a $10,000 check to Larry and Ann Cihanek when they arrive with the new Goats on April 26th. While $10,000 will not rebuild their barn or replace all their beloved goats, it will at least give them a good start. Our historic Jersey City Cemetery is an amazing Cultural Heritage site, and the exciting Goat Project has also helped us raise much awareness of our mission. Our volunteer mission and our Goat project were featured in local and national news, including live on-site broadcasts by News 12, Fox 5, The New York Times, and many publications. We were also featured in a television series called 'Urban Animals". This exciting project was a 'win-win' , both for the Cemetery volunteer mission, and for Jersey City & Hudson County - to have this Creative Eco-Friendly solution with Goats in the city!! Its been a very long time since there were Goats in Jersey City. This was such a wonderful gift for the community, as well as a major help to our ongoing work at our historic Cemetery. If any of your groups or businesses, or even individuals, would like to consider being a SPONSOR of the 2015 "The Kids are Alright!" - our Eco-Friendly Weed Eradication Goat Project, will you kindly contact me at 201-707-0738, or please consider making a contribution via our website at www.jerseycitycemetery.org. Please just add a note "GOATS". Checks payable to "Jersey City Cemetery' may also be mailed to Historic Jersey CIty Cemetery at 435 Newark Avenue, Jersey City, NJ 07302. Again, please note 'GOATS' on your check. Sponsorships levels are $500, $1000 and $1500, however, any individual "supporter" contribution for the Goats will be gladly accepted and appreciated. ALL PROCEEDS COLLECTED will be turned over to Larry & Ann Cihanek, the Goat Herders, on Sunday, April 26th, at our Earth Day Festival when we welcome the new goats. I hope you will consider helping this wonderful cause. Please feel free to SHARE our plea to help. Thank you so much. Would be wonderful if Jersey City, plus our Hudson County Freeholders, would also consider helping us to sponsor this heartwarming project. Maybe one day, we can have Goats helping out in many of our city & county Parks!! This amended Farmer's Market ordinance went before the city council for a 1st reading Feb 25th and will be having it's final 2nd reading March 11th. Anyone from the public can speak at a 2nd reading. 3) Place the first table of the outdoor café more than 20’ away from the Erie Street neighbor’s stoop. 4) Build an extra wall with a space between the new wall and the original wall to help sound proof for the neighbor on the Erie side of the building. Michael Hrdlovic and Camillus (Cammy) O’Callaghan would like to open a restaurant at 223-225 Pavonia. They would be leasing the space for approximately 15 yrs and the restaurant/bar would seat approximately 90 inside and 75 outside. The space is not zoned to be a restaurant so they would need to obtain a zoning change and a liquor license. Michael Hrdlovic is currently operating Dorrian's Restaurant/Bar in Newport Jersey City. He has been working there for the past 11 years with Cammy O'Callaghan. Michael lives in Hamilton Park and welcomes everyone to come and visit Dorrian's to see how they operate their establishment. As of today we do not know what time the outdoor café and the restaurant will be permitted to stay open until. The developer says that it all depends on the Zoning Board and that they are willing to work with the neighborhood on this issue. The developer could also apply sound proofing panels for the Erie Street neighbor but has not guaranteed to do so. The placement of any property in a restaurant overlay zone follows the usual procedure of any Zoning Change of a recommendation by the Planning Board and adoption of an ordinance adopting the Zoning by the Municipal Council. Since this property is within a historic district the Planning Board could refer any proposed changes in zoning to the HPC for review and recommendation. 1. Restaurant Overlay Zones (ROZ) shall apply to the areas depicted on the Jersey City Zoning Map. The ROZ is intended to apply as an overlay, which means that it applies an alternative zoning pattern when and if chosen by the property owner.(N.B. AFTER ADOPTION OF AN ORDINANCE BY THE CITY COUNCIL) Within a ROZ, existing zoning regulations continue unchanged. The application of ROZ zoning provides for a new, additional permitted principal use restaurants. i. Restaurants, category one and two. i. Sidewalk Cafés (subject to the provisions of Chapter 296, Article XII, Sidewalk Cafés). ii. Live entertainment subject to issuance of a "Restaurant Entertainment License" by the Division of Commerce and the restrictions as to decibel level, hours of operation, and location of entertainment providers attached to that license (see Ordinance #12-001). i. No setback from any lot line shall be required for existing structures that are not to be enlarged. However, in the event that a separation of structures exists, or is proposed in the event of new construction, the minimum distance between any rear wall of a building proposed for a ROZ restaurant use and any rear wall of an adjacent building containing any residential uses shall be fifteen (15) feet, as measured from building face to building face, except in the case of corner lots, where no minimum or maximum separation shall apply. Anything to the contrary hereinbefore notwithstanding, and for the benefit not of property but of persons attendant therein, no license shall be issued for the sale of alcoholic beverages within two hundred feet of any church or public schoolhouse or private schoolhouse not conducted for pecuniary profit, except to manufacturers, wholesalers, hotels, clubs and fraternal organizations which owned or were actually in possession of the licensed premises on December sixth, one thousand nine hundred and thirty-three. The protection of this section may be waived at the issuance of the license and at each renewal thereafter, by the duly authorized governing body on authority of such church or school, such waiver to be effective until the date of the next renewal of the license. Said two hundred feet shall be measured in the normal way that a pedestrian would properly walk from the nearest entrance of said church or school to the nearest entrance of the premises sought to be licensed. The prohibition contained in this section shall not apply to the renewal of any license where no such church or schoolhouse was located within two hundred feet of the licensed premises as aforesaid at the time of the issuance of the license, nor to the issuance or renewal, or both, of any license where such premises have been heretofore licensed for the sale of alcoholic beverages or intoxicating liquors, and such church or schoolhouse was constructed or established, or both, during the time said premises were operated under said previous license. Notwithstanding the provisions of Revised Statutes 33:1-76 if a plenary or limited retail distribution license has been or shall be granted on a waiver of its protection granted on authority of a church or school, and such license has been, or shall have been renewed on authority of annual waivers by the church or school for 15 or more consecutive years, the holder of such license shall thereafter be entitled to apply for renewal or reissuance thereof without further or renewed authority, or waiver, of the church or school; but the renewal or reissuance of such license after a revocation, shall not be permitted without a new waiver granted on authority of the church or school. In 2014 the Jersey City Board of Education completed a demographic study that forecast a 25% increase in the student age population in the next five years in downtown Jersey City. To help meet the potential demand for school services, the Jersey City Board of Education submitted a bid to the JCRA to use empty classrooms in the 9th & Marin building starting in the fall of 2014. The JCBOE would have used the space to create more PreK classrooms for downtown and an arts focused middle school open to all Jersey City residents. The JCBOE also agreed to share the building with any other tenants that may want to use the remaining space. In January 2015 the JCRA announced that 4 bids had been submitted and all of them were rejected. The building continues to sit unused at this time. The City's long term plans for the building have not been communicated. 180 9th Street was the home to The Betz Brewery. The building was taken by the city and demolished. The golden door charter school was built under the Schundler Administration from a $32 million bond that included $9.5 million for an "educational-recreation center" on the site of the for Betz Brewery. The Golden Door Charter School occupied the building for 13 years until 2011. The monthly rent started out in the high $60,000's and was $77,000 per month when Golden Door had to move locations as they were unable to pay another rent increase which would raise the rent to $85,000 per month. As of 2014 the city has a debt of approximately $725,000 per year on the building.